Awarded the prestigious Plant of the Year award at the 2011 Chelsea Flower Show. It is very much sought after as initial production numbers had been very low. Extremely vigorous and long flowering yet non invasive and well behaved. The first of it's kind for a Hardy Japanese Anemone - very limited stocks. Supplied as a well established plant in a 3L pot, 30-50cm tall, in bud and flower. 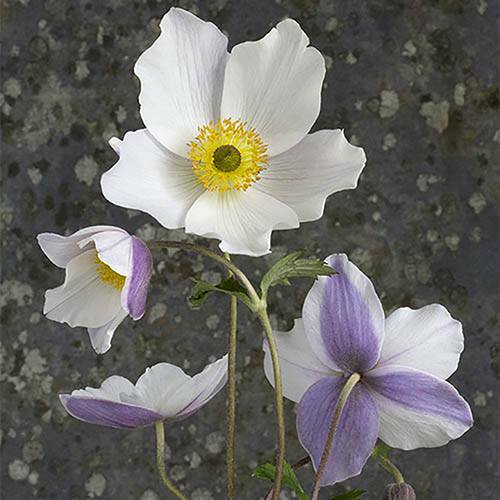 Anemone Wild Swan is one of the outstanding plant introductions of recent years and was awarded the prestigious Plant of the Year award at the 2011 Chelsea Flower Show. It is very much sought after as initial production numbers had been very low. Bred in Scotland by Elizabeth MacGregor, Wild Swan is extremely vigorous and long flowering yet non invasive and well behaved. The first of it's kind for a Hardy Japanese Anemone, the delightful and beautiful white flowers have a most unusual lilac on the reverse and appear from mid Summer right through till November. At twilight these close to a nodding bicolour bell. Best in deep rich soil in dappled shade. Very limited stocks - not widely offered in this mature size, if at all. Supplied as a well established plants in 4L pot, 30-50cm tall in bud and flower.